Pompano Precision Products, Inc. has been in business since 1969. From our early days of supplying screw machine parts produced on cam operated machines, we have evolved into a state of the art ISO 9001:2015 Certified CNC precision machining and assembly operation. 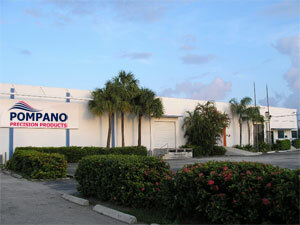 In 2005 we moved into our current facility, a 14,000 SF building located in Pompano Beach, Florida. Pompano Precison Products, Inc. is a contract manufacturer of precision machined components and assemblies. It is our policy to provide products and services that meet or exceed the requirements and expectations of our customers. We strive to consistently provide our products and services with the highest standards of quality, delivery, dependability and integrity. This will be achieved through the involvement of a well trained staff and programs that contribute to continuous improvement. The ultimate measure of the success of our company will be determined by the satisfaction and confidence expressed by our customers in what we do and how well we do it. Pompano Precision Products, Inc. is an Equal Opportunity Employer and a Drug-Free Workplace. For job opportunities please contact our Human Resource Department.